It's killing me how little I have been posting lately, and I feel like I owe an explanation of some sort. 7:30 - Care and Prevention of Athletic Injuries Lab Practical. Before Midnight- Complete 10 blog posts for Communication of leadership. A member of your high school tennis team comes to you complaining of an extremely sore elbow, especially on the outside (lateral). She just returned from a big tournament where she played many matches. Upon examination you note that she has pain in the region of the lateral humeral epicondyles that becomes worse immediately after participation. She also states that the pain sometimes radiates into the muscles of the forearm. The lateral epicondyle appears to be swollen. What would you conclude based on this information? What would you recommend to this athlete? How is it possible to love something so much, yet hate it at the same time? When I figure it out I'll get back to you. In the mean time just sit tight, next week I'll be back up and running. For now your prayers are much appreciated! What's your major? I was thinking about going back to school for Physical Therapy or something in the sports medicine field. It seems like that's what you're going to school for as well. I'm majoring in Kinesiology with an emphasis on sports medicine and nutrition. I'd say 80% of us are shooting to be a PT, or a PTA. I would totally recommend it, it is so much fun, it hardly feels like work until finals week haha. Good luck on finals! Been there and know how extremely stressful it can be. I feel like I never got to really enjoy the holiday season in college. It's like you finish finals, finally de-stress from them, then stress because you haven't bought any gifts because you were studying 12 hours a day for finals, then it's Christmas. Repeat x4 (or more). 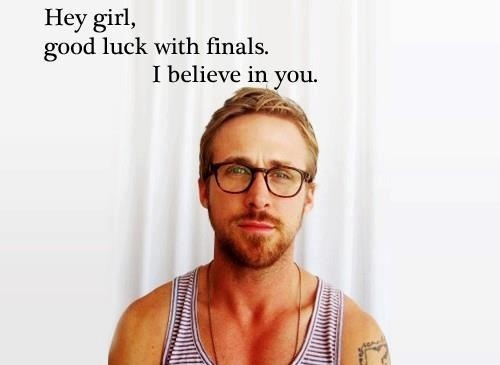 Haha I keep looking at the Ryan Gosling photo of wishing me good luck before every one of my finals. Tomorrow is my last exam THANK GOD. My finals have been ridiculous (3 exams in 24 hours) and I only had one day to rest between my other 2 days (not fun). Not to mention I have had two jobs where I applied three months ago FINALLY call me back and ask me to start during exams (ya right). Tired, exhausted, and I feel your pain. Finals just mess everything up. I'm two down three to go, and boy am I jealous of you with one left haha. 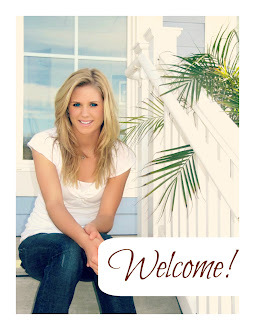 Thanks for linking up at the friday chaos this week. School is number one! My husband got his BS in Kinesiology and Sports Psych. I've seen how grueling some of those exams can be. I'll be sending good vibes your way! You're gonna rock them girl!